Fashion designer Giorgio Armani is passionate about eliminating world poverty and AIDS, and has worked with Julia Roberts to create a T-Shirt for (RED). 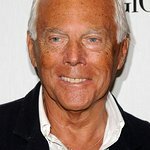 Armani was appointed a Goodwill Ambassador for the United Nations High Commissioner for Refugees (UNHCR) in 2002. Google trends for "Giorgio Armani"
We don't have any videos related to Giorgio Armani.